Just two days before he was named Rex Tillerson’s successor as secretary of state, CIA Director Mike Pompeo appeared on the Sunday morning shows and staked out exceedingly ambitious goals for Donald Trump’s upcoming summit with North Korean leader Kim Jong-Un. Pompeo, an unsparing critic of the nuclear agreement with Iran, vowed to not repeat Barack Obama’s mistakes. What he promised was breathtaking: that President Trump would secure a better deal with North Korea, which already has a sophisticated nuclear-weapons arsenal, than his predecessor did with Iran, which had yet to acquire nuclear weapons. The remarks are telling in light of Tuesday’s news that it will be Pompeo leading America’s outreach to North Korea when he replaces Rex Tillerson at the State Department. Pompeo will become the nation’s chief diplomat just as the Trump administration is preparing to negotiate directly with the North Koreans for the first time. And his public statements about North Korea’s nuclear program offer clues about where and how his approach will differ from Tillerson’s. At the State Department and CIA, respectively, Tillerson and Pompeo have both prioritized the North Korean nuclear threat and focused on pressuring North Korea economically and diplomatically. But whereas Tillerson has expressed eagerness to create the right conditions for negotiations with North Korea, Pompeo has voiced profound skepticism about what such talks can accomplish. Whereas Tillerson has been thoroughly marginalized by the White House, Pompeo has managed to maintain the president’s trust, regularly delivering Trump’s intelligence briefings in person. And whereas Tillerson has been associated with a faction in the administration resistant to military options to deal with the North’s nuclear program, Pompeo has taken a more aggressive position. Tillerson once declared that the United States wasn’t seeking regime change in North Korea; Pompeo once remarked, rather suggestively, that the administration was seeking ways to “separate” Kim Jong Un from his nuclear weapons. What made Pompeo’s comments remarkable wasn’t just his assertion that the United States could compel North Korea to do what most experts believe North Korea never will: fully give up its nuclear weapons. It was also how confidently he made the claim given what he’s said in the past about North Korea. Pompeo, drawing on the work of intelligence analysts, has also described Kim Jong Un as a “rational actor” whose “mission is to stay in power” and who believes his primary means of doing so is to “hold the world at risk with a nuclear weapon,” which indicates that it will be no easy feat to persuade him otherwise. Like Tillerson, Pompeo has insisted that the Trump administration wants to try everything short of military action to sway Kim off his current course. But he’s refused to rule out war if peaceful measures fail—a possibility Tillerson has tended to downplay. Still, Pompeo has set a higher bar for what could trigger a U.S. first strike on North Korea than other hard-line administration officials such as National-Security Adviser H.R. McMaster or the president himself. At the American Enterprise Institute, Pompeo said Trump was intent on preventing North Korea—by force if necessary—from obtaining not a single “showpiece” nuclear-tipped long-range missile, but a whole “arsenal” of these missiles that can “reliably deliver” nuclear weapons to the United States. Nevertheless, Pompeo isn’t dismissive of the threats posed by a North Korea that doesn’t quite have the ability to credibly threaten the United States with nuclear armageddon—one that, say, strikes a deal with Trump to freeze its nuclear-weapons program but not dismantle it. 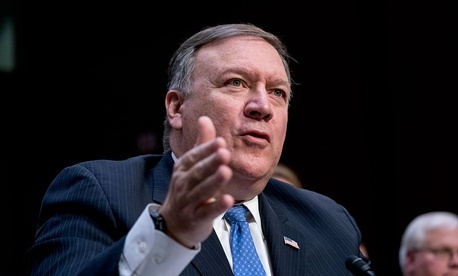 Pompeo has warned that the Kim regime could sell nuclear technology to other states or non-state actors like terrorist groups, motivate neighboring nations to develop their own nuclear weapons, or use its weapons as blackmail to try and reunify the Korean peninsula under North Korean rule. Kim Jong Un may act rationally, Pompeo argues, but the Supreme Leader of North Korea probably isn’t getting quality information and advice from his aides—a dangerous situation when nuclear weapons are in the mix. “It is not a healthy thing to be a senior leader and bring bad news to Kim Jong Un. Tell someone you’re going to do that and try to get life insurance,” he’s joked. As for what advice Donald Trump will be getting, on Sunday Pompeo stated that Secretary of State Tillerson wouldn’t be spearheading nuclear negotiations with North Korea. “The president of the United States is going to take the lead,” he said on CBS. The question now is which Secretary of State Pompeo—the clear-eyed realist or denuclearization absolutist—will follow right behind Trump, and what that will mean for the fate of the most audacious American diplomatic gamble in decades.